Fatal Accident at Tilmanstone Colliery. A fifteen years old haulage boy, Arthur William Moore, was fatally injured during the morning shift at Tilmanstone Colliery on Thursday. He was employed underground in No. 220's district, and was crushed by the moving tubs which bring coal from where it is cut to the bottom of the shaft. Moore was the only child of Mr. and Mrs. W. Moore, of "Hoyland" Ashley. All men ceased work, as is usual in the case of a fatality. Grave found at All Saints, Waldershare. Nice photo, John. As you say, it looks to be fairly late on by the car approaching. 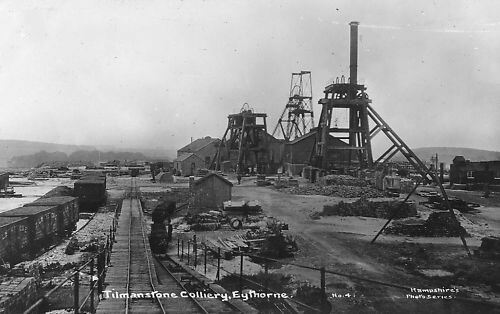 I've just found this photo of Tilmanstone Colliery taken by my late Father in Law, Allan J Yates. He took up photography in his retirement years during the 80s. It looks like it was taken during the first stages of decommissioning as I can't see any ropes attached etc. Such a shame those pitheads weren't saved like the one in Wales - would have made a brilliant museum. I though it would be nice to share. Mary's brother has told me that there is an exhibition today (Sun. 17/03/2013) at the Welfare Hall, Elvington in connection with the Colliery. I believe the EKLR is running too. Radio Kent gave a mention of this mine this morning. I missed the actual content of the item but I thought I heard something about 100 year celebration and that maybe something is happening there today? A couple of images from the 'web..
A fairly common image, it shows the loco EKR no.1, the Fox,Walker 0-6-0ST in 1914. This one shows three of the seemingly photographically elusive 'Tilmanstone' private owner coal wagons on the left. Few photos attached on Tilmanston Colliery Ropeway, would have dearly loved to have viewed all of this in operational days, quite a sight and most interesting. 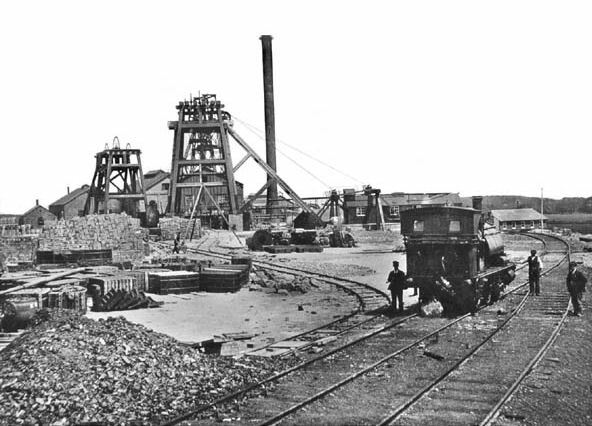 On the 14th January 1909 the hoppit at Tilmanstone Colliery was being raised at No.1 pit when the steam was cut out too early and an over-wind occurred, this resulted in the pulley wheel breaking sending the hoppit back down into the pit. Unfortunately the men were working in the shaft at the bottom and the hoppit, which was loaded up and weighing about 3 tons, landed within the men, killing three of them. The three men were R. Smesson, James Hambrook and Harry Arnold. Officials rushed down into the pit within a few minutes and brought up the bodies of the three men, surprisingly the bodies showed no signs of injury. The directors released a statement deploring the accident but they said in all other respects it was not a serious accident and no serious damage had been sustained to the shaft and fittings, work would begin again within 48 hours. At the time the colliery was being sunk by Kent Coal Concessions Limited. Two shafts were being sunk, the No.1 shaft, where the accident occurred, which is down to 922 feet, and Gabrielle Pit, which is sunk to a depth of 761 feet. I was shown the death certificate recently of a poor chap who fell through a hole in scaffolding and plunged down the shaft at Tilmanstone Colliery.Death was by drowning and i believe the year was 1920 but i'm not sure about that.My partner's gran used to rent out a room at Eythorne for the registrar there to use.I understand the victim was a relative of my partner's family.It seems the registrar for that district had a garage business in the village in those days. Gosh Roders i'm glad i just shunted coal wagons up top!I think my Mary's father worked on the Kent Fire process.Once during my short time as a coal delivery driver i dropped off a ton of the wrong stuff at one address.It was the stuff shaped something like a walnut.The home owner was not too pleased with me! I went down Tilmanstone in the mid 60's with a group of lads. We had all just started in the coal industry and the coal board arranged a 'tour'! The experience will stay with me forever! I had borrowed some Tuff Big T boots from a friend (i thought my football boots wouldn't look right and i had no other suitable footwear) new they were a sort of sand colour - my mate was not best pleased when i gave them back! Thanks for that interesting information omega4040!My old school friend was also aiming to be a geologist and i can recall how important his A level results were to him back in 1968.We lost touch after that.Your details of the water under Kent shows how wet these mines were.I suppose it also explains how in wet years the water used to jet out of the brickwork in Abbotscliffe railway tunnel and the Nailbourne streams flowed again.